Stats Confirm, Don't Build Houses If You Want to Increase Incomes. In response to Ian Mulheirn's thorough de-bunking of the supply shortage narrative of the housing crisis, Capex has let John Myers, aka London YIMBY, have yet more publicity to rally the troops against the dissenting voices. The article is just a re-heat of the same old tosh, however one thing that did catch my eye was this graph from the Resolution Foundation showing the relationship between rises in house prices and the increase in housing stock per capita. Myers comments ". . the think tank’s report also contained the encouraging — and unsurprising — revelation that countries building plenty of homes have generally not seen huge price rises, despite low interest rates and a big banking sector." Myers goes on "Accounting for changes in incomes would likely make the picture even clearer, as the government’s own numbers to justify the Housing Minister’s comments on immigration showed last week, because rising incomes greatly boost demand for bigger and better homes"
Leaving to one side that in Myers articles, its never location that is the biggest factor in the differences in prices across the UK, the point he raises is obvious. So let's correlate changes in incomes within countries during the same period(OECD data), and for a bit of fun, with changes in housing stock. 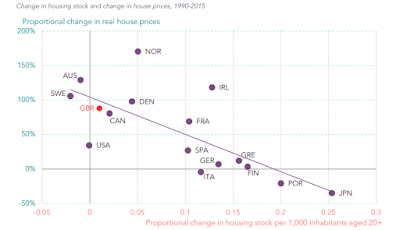 What this shows is that an increase in housing stock per capita correlates with lower increases in incomes within countries at 0.61, which is probably about as strong as the scatter plot for price increases vs stock. 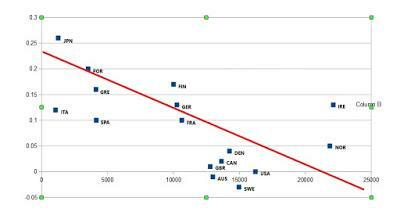 It's interesting how Ireland is the outlier, probably due to their over supply on the run up to the crash. On the face of it, it appears that if you want to enjoy bigger increases in incomes, the last thing you want to be doing is build loads of housing. Of course, this is wrong. But my point is, without putting things into their proper context, all sorts of misleading conclusions can be drawn. I'm afraid that's why the current policy of blaming planning and under supply for housing issues is wrong. It's being pushed by those with a very narrow field of vision. For the record, I think a land value tax would result in a huge amount of redevelopment. Only it would then be property facilitated and directed by planners with the right incentives ie to maximise aggregated land rents. Instead, in large part due to the supply side fanatics, we'll yet again end up with the worst of both worlds ie more crap and not much/no improvement in affordabilty.